The Burning Bush is a shrubby, perennial herb that is hardy in USDA zones 3-7. Gas Plants grow best in full sun, but will tolerate some light shade during the hottest summer months. but they will appreciate the addition of a small amount of lime at planting time. Once established, these plants are very drought tolerant and maintenance free. Mature Burning Bush plants will grow to 24 to 36 inches in height and width. 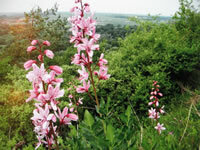 They produce an abundance of 1½"-2" white, pink, or purple flowers on 12" spikes in mid summer. Dictamnus is a long lived plant (up to 50 years) that resents transplanting. Choose your initial planting spot carefully so you won't have to transplant it later. so take the proper precautions if you don't want your plant to be quickly ravaged by these awful creatures! Propagation of Burning Bush plants can only be accomplished by seed. or the seeds can be started indoors, after chilling for 4-6 weeks in the refrigerator. Maintain a temperature within the planting medium of 55°-60°. you are probably better off to purchase your plants from a good nursery.